I'm currently on a bit of a classics kick lately in my reading, having read The Man in the High Tower, then All Quiet On the Western Front and now Catch-22. I've enjoyed all three quite a bit so far even though I am only about a third of the way through Catch. 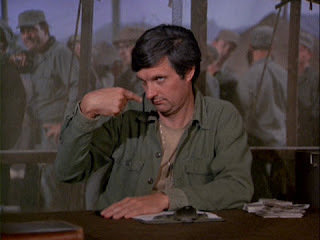 One of the things that struck me about it how similar it is to the TV version of M.A.S.H. MASH itself has a bit of a confusing legacy. It's best know as the TV show that ran from 1972 to 1983 about surgeons serving in the Korean War, a TV show that was an adaptation of a largely forgotten movie that was itself and adaptation of an even more forgotten book, overshadowed by the TV show that bares their name. And for good reason, MASH is unquestionably one of the greatest TV shows of all time, a personal favorite and one I re-watched in its entirety early this year. So what does all this have to do with a novel written in 1960 that no one really remember outside the phrase that it gave its name to? Turns out quite a lot. You see, Catch 22 is about a pilot in World War Two who's only goal in life is not to die. Drafted and thrown into a war zone he spends as much of time trying to get out of fighting as he does getting thrown in to it. Surrounding him are a group of wacky, crazy characters who get into their own antics and adventures. The whole book is basically one long, incredibly manic episode of MASH, even though it came out over a decade before MASH the TV show and a whole seven years before the book that inspired the movie that inspired the show. Confused yet? Don't be, cause they're all rather similar from a bird's eye view. You see MASH the TV show is about a surgeon drafted into the Korean War who's only goal in life is not to die. He spends a great deal of time roaming the camp and getting into trouble with his hair brained, psychotic cast of background characters until the shells start flying and the casualties start coming in. Then he's up to his elbows in blood and guts trying to save the lives of kids who should be making out at drive in theaters instead of dying in a war zone. Both of these stories are about people trying to stay sane in living hells, in the worst places on earth and craziest of all, both stories are meant to be funny. They are comedies through and through. They exists to make you laugh. Cause what's funnier than war? I cannot say for certain what inspired the collective writers of MASH over the years because I have never met them, but I think the influence of the novel on the show is fairly clear to anyone who has witnessed both works. And there's nothing wrong with that, taking influences from what came before is how we grow as writers, it's how we push the medium forward. I think too, that a novel like Catch 22, itself coming out to mix reception at release and then going on to becoming one of the classics of American literature helped pave the way for shows like MASH, itself a risky and boundary pushing show of the time. MASH, the show, had an enormous challenge ahead of it. This was a show about Korea, the last great American War coming out in a time of America's current greatest war, Vietnam. The show was meant to serve not just as comedy, but as a political statement. That was hard enough to do at the time, hell it's hard enough to do now. But to go the extra step and say we want this to be a comedy, to go even further and say we want this to be a comedy with a message, with dramatic intent, with a political will, well that's damn near impossible. Even if you can pull it off on paper, even if you get a studio to green light it, getting an audience to ride the emotional waves as you crest and crash from comedy to casualties, from laughter to tragedy is a challenge for any writer in any medium. But they pull it off. Both Catch 22 and MASH are able to pull off this effortless drift along the spectrum in a way that somehow feels natural, maybe because that's how real wars are, laughing one minute and running for your life the next. Catch 22 tends to be more blunt, punctuating sentence after sentence of jokes with an off hand, casual mention of a characters death. MASH tends to play its focus tighter, sometimes pushing its downer moments to the climax of an episode or separating the antics in the Swamp from those in Surgery. In the end they manage to strike a balance that allows the reader and viewer to experience the whole range of emotions intended, to be pulled to and fro without ever getting ripped from the story completely. Which brings me to Scrubs. 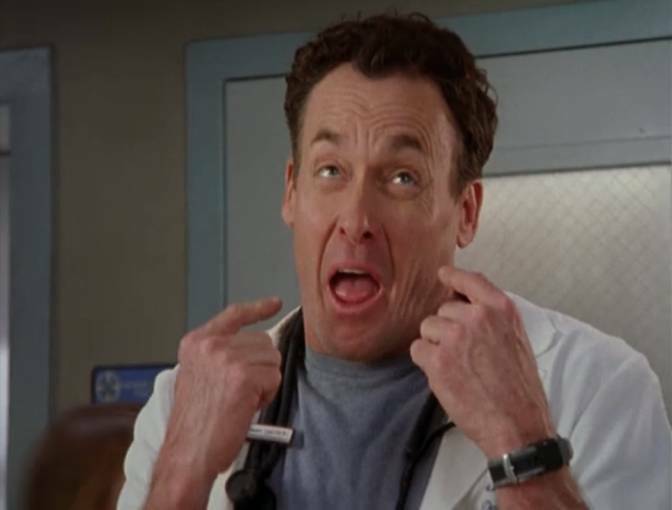 Scrubs is also, in my opinion, one of the greatest half hour sitcoms to ever grace a television set. "My Screw Up" and "My Lunch" are two of the greatest episodes of television period and ones I think back to often. The show as a whole, while largely a goofy comedy was able to, seemingly effortlessly, slide into more dramatic and sometimes tragic moments. It walked a path laid down before it by shows like MASH, by books like Catch 22. There were many, many medical shows before Scrubs and even medical comedies. MASH even had its own ill fated spin off set in a normal hospital back in the states, so it was by no means the first. But the works that came before helped inspire it, they helped lay the ground work for future shows to follow in their footsteps, for future creators to point back and show a precedent for when it was successful. Through works as these we can see the lineages of our own works, of those that came before. I think we often spend a lot of time looking at and thinking about our direct influences, on our creative idols and the altars upon which we worship them. Perhaps we should take more time to consider those who paved the roads we now use, rather than those who walked them. Missed Opportunities is a series dedicated to looking at narrative and mechanical choices in games. It is not an indictment of a game's quality, nor is it it a look at mediocre games that could have been better. It is a discussion of differing paths, of choice in design. Final Fantasy VII is a great game. While it is not my Final Fantasy of choice (that honor would go to VI) it is unquestionably one of the most influential JRPG's in video game history. It was, for many, their first major JRPG and one of the first to tackle major themes and ideas. I came late to the FF VII party, not owning a playstation until well into its life cycle. By the time I got around to cracking open the multi disc case of Final Fantasy VII, it was already one of the most well regarded games around. It was raved about, not just in magazines, not just in playgrounds but among the entire spectrum of video game enthusiast. It was a phenomenon within the industry and made a wide impact on gamers. FF VII was not my first JRPG. It was not even close to my first JRPG, and VI, the previous entry in the series, had left a high water mark to overcome. The 2D, sprite based predecessor of this newer game, with its expansive cast of characters, memorable story sequences and amazing soundtrack had left an impression on me that would be hard to beat. I have to admit, going into VII, I was skeptical. This newer game, this latest in a long series was a departure. It was the first Final Fantasy to be 3D, using primitive polygons and textures over the handcrafted look of sprites exhibited by the game's predecessors. It was the first on a disk based platform, complete with loading times and impressive, pre-rendered cut scenes. But those were only surface differences. A deeper, more meaningful change was waiting. This of course, was the materia system. The previous Final Fantasy games were class based with the familiar mixes of Fighters, Thieves and Mages. Black Mages cast powerful destruction magic while the ever useful White Mages healed the party and kept your characters in the fight. There were Red Mages and Monks, Bards and Knights. Each character had their role to fill in the party. While they may level up, earn new abilities or change to advanced classes, their roles were largely the same. The brave knight hitting hard and soaking up damage, the wizardly black mage hanging back and casting fireballs or calling down lighting bolts and the battlefield medic of a white mage, curing poisons and patching up wounds. In Final Fantasy VII, this all changes. Now, instead of classes or jobs, characters had materia. These little, spherical items of magic were slotted into the characters equipment and gave them special abilities. You no long had to be a Black Mage to cast a fireball, or a White Mage to heal, now all you had to do was equip the fireball materia to whichever character you wanted to be able to use the ability and it was theirs, enabling them to sling balls of fire with the best of the them. And this is where I think they missed an opportunity, not from a game play perspective, but from a narrative one. The story of Final Fantasy VII is not what one would call simple. There are the familiar tropes of the series for sure, oppressive governments out to put down the little guys and evil masterminds seizing powerful magics to destroy the world and become a god. A rag tag band of heroes who have to come together to stop it. This is not just well worn territory for the series, but the fantasy genre as a whole. Final Fantasy VII mixes their magic with technological elements, a terrorist with a cybernetic gun for an arm, energy reactors controlled by evil corporations, and cloned cells from an alien specimen known as Jenova. The story weaves itself through these tropes, beginning with the main character, Cloud Strife, acting as a mercenary for hire to a group of eco terrorist trying to save the world by destroying a city's energy reactors. The job goes sideways, the reactor explodes and Cloud falls down into the city's slums, separated from the rest of his party. It is here that he is found by Aerith, a lowly flower girl with a pretty face and a pure heart. Aerith is who the player would presume to be the love interest. A sweet, idyllic young lady living in the slums, making a living selling flowers to passers by. She is also who one would presume to be the White Mage of the party. The healer, the nurturing hand to bring the party back to life. She even gets Cloud back on his feet after he crashes on to her flower bed from above. In true fantasy fashion, bad guys show up for the girl and Cloud agrees to be her bodyguard. All the pieces are in place for a grand adventure, for the hero to save the world and woo the girl and live happily ever after. But this is Final Fantasy VII, and in Final Fantasy VII, Aerith dies. Her death, more than any other in video games up to that point had a profound effect on those playing the game. Even knowing her fate before I ever started the game, her death was an impactful and meaningful scene. This wasn't a one off character, this wasn't some living piece of the background with a generic name and a few lines of dialogue. This was a major character, one the player's party had spent significant time with. Aerith was the sage of the story, the Zelda to Could's Link. She, with the help and protection of the hero was supposed to save the world, not get stabbed in the back and be left dying his arms. This was a video game, and characters aren't supposed to die in games. Well, at least not permanently. Mario might fall down a pit, Link might need a fairy to get him back on his feet, but in Final Fantasy the death of a single character was never game over. A trip to an Inn or a Phoenix Down would bring them back to life as if they only needed a little rest, a little time to get their strength back. It was only when the entire party went down would you be faced with a game over, forced to restart from your last save point and continue as if the defeat had never happened, as if it was part of some aborted timeline that no longer held impact on the rest of the world. There would be no Phoenix Down for Aerith, no bandage for her wounds. Our hero carries her to a pool beneath the city and lays her to rest beneath the water. You could restart from a previous save, but it wouldn't matter. There was no avoiding this fate. This is how the story goes. Aerith dies and there's nothing you can do but swear vengeance and chase after the villain who killed her. Vengeance was not what I was thinking about when Aerith died. It wasn't anger at the game's villain who killed her, or how I was going to stop his plot to end the world. I wasn't shocked, or horrified. I wasn't stunned by the lost of the pretty flower girl or a potential love interest. I was worried about my materia. You see, Aerith was my White Mage. She held all my healing magic, all my spells that I used to keep my fighters fighting. And when she died, those spells were lodged in her inventory. An inventory that was now floating at the bottom of a pool around Aerith's lifeless corpse. How was I going to continue without a White Mage, without a healer? Would I be able to get enough potions? Would I find new materia that would allow me to heal? How was I going to stop the bad guy, to fight through his army of minions and save the world without the ability to heal my party? Here was an idea that I had never encountered before in a JRPG. Killing a character is one thing, killing the love interest even more shocking, but to kill the white mage, to kill the healer. This was unheard of. Remove a character from a story and you're left with one less character. Remove a class from a]the party and you're left with an entirely different game. Video games, the best of them anyway, are not just stories, they aren't just game play, they are the marriage of the two, each supporting and enhancing the other. This is where, to me, Final Fantasy VII fails, where it misses its opportunity. Because the healing materia, the spell I needed most, was safely moved to Cloud's inventory after Aerith's death. All gameplay consequences were removed from her demise. Now another member of the party could be the healer, could be the defacto White Mage as we traveled across the world in search of an evil man and his evil plans. Aerith, while fondly remembered, would no longer be missed. Instead she would fade into the background as the party pushed on, meeting new characters and finding new spells. How often would one have thought of her, had FF VII kept their class structure, had removed their White Mage from the game half way through? How often would you have missed her when neck deep in a dungeon, when in the final stretch of a tough boss battle? Final Fantasy VII could have shown just how important a single character can be to a party, just how important of a role one person can play among a larger narrative, among a war. Instead they chose to build a system around materia, around spells that can be transferred from character to character with little consequence. And in the process, missed and excellent opportunity. Disclaimer #1: The following contains minor spoilers for the beginning of Fallout 4. Disclaimer #2: I have not finished Fallout 4 and am only a few hours into the campaign, thus if there are any late game revelations about the following, I have not yet seen them. Fallout 4 has a fantastic intro. It's an intro that I believe lives up to the studio's pedigree despite what I'm going to talk about. Waking up on a storm battered ship in Morrowind, escaping from prison along side a king, being saved from execution by the timely arrival of a dragon, seeing the early years of your life as you grow up deep underground. The studio has always had a knack for openings that draw the player into the world while setting up the grand adventures to come. Fallout 4's intro is no different. The game opens with you, the player, standing in front of the mirror, getting ready for another pleasant morning in the idyllic Sanctuary Hills. Your beautiful wife stands behind you, lovingly commenting as you alter your character's appearance. When you're finished, she takes her turn getting ready and the player is free to roam their simple house awash in Fallout's altered version of 1950's America. Your infant son, Shawn, lies in a crib with a rocket ship mobile, his wooden blocks scattered around the room. A forgotten board game sits in a closet. Your household robot is waiting for you in the kitchen with a steaming cup of coffee. You spend the morning watching TV with your wife, calming your crying son and dealing with a pushy door to door salesman. It's the American dream bottled down into a short, ten minute experience and it works wonderfully. Then the world ends and you're running. Where to or why you're not so sure. You just know that it's safety, safety for your wife and child in a world suddenly changed, in a world forever lost. You make it, one of the last to reach the Vault as the bombs fall. You watch as the mushroom cloud grows in the distance, as the elevator starts to descend into the earth. Technicians waiting for you at the bottom assure you that everything's going to be alright, that you, your wife and your child are going to be safe and sound and provided for. You relax, trying to figure out what this new life will entail. You finally let your guard down and let yourself breathe, right before the people you trust stick you in a tank that cryogenically freezes you. And here's where I think Fallout misses a great opportunity, while you're there in the tank. I love the idea of freezing the player, of taking the fish out water approach with the vault dweller. Like the player, the character didn't grow up in this wasteland. They're use to fast food, the nightly news and all American apple pie, not super mutants, rad roaches and Synths. It's a great way to marry what the character is going through to what the player experiences. My problem is what happens while you're in the tank. They shoot your wife in the head. They shoot her right in the damn head and they take your baby and then you go back on ice like the world's worst Captain America impression. You wake up, cold and alone and venture out into the world. Into your neighborhood shattered by the bomb. Into the ashes of your once perfect house. You wander off into the wasteland in search of a son you may not even recognize, unsure of how long you've been asleep. And I know why they do it. They want to motivate the player. What better motivation than kidnapping your only child and shooting your pretty, lovely, complimenting you while you fix your hair in the mirror, wife. They do it because they don't want to deal with the baggage, they don't want to anchor the player with this nagging wife whining about her missing son. They want to motivate the player while simultaneously giving him the freedom to conquer the wasteland however they want. They know what they're doing. They put her in that classic 1950's dress, give her that pleasant, homely voice and the slender figure and then they shoot her in the head. You can't do anything to stop it. You can't fix it. All you can do is take her wedding ring off her cold dead finger and swear revenge like some 80's action hero. I hate it because it's easy, because it's cheap and easy. And I hate it because it caused them to miss something with so much more depth, with so much more reason. Imagine what would have happened if they hadn't shot your wife in her adorable little temple. Instead, they kidnap your kid and push her back in the ice box and the two of you thaw slowly out together. She panicking, crying. You wrap your arms around her and tell her everything's going to be all right. The two of you emerge into the wasteland together. You pick through the ruins of your shattered house, comfort your house robot that's been slowly going insane from two hundred years without anyone to talk to. Try to put the pieces of your lives back together. Narratively, it's a far stronger option. But that's not the only reason I thought they should have gone that way. You see, Fallout 4 has a problem. It has the same problem every Bethesda open world game has. The player has to find their son, it's the only thing that matters to them, the only thing on their mind, a singular goal to motivate them through the trials ahead. Except it isn't. There's the minutemen to rebuild. There settlements to grow. The Brotherhood of Steel to join or fight. The question of the Synths and what should happen to them. The wasteland of the commonwealth is a complex and ever evolving place that the player is asked to weigh in on. Hours into the game I haven't even begun to look for my son. But my settlement has defensive turrets and some pretty sick lights, so clearly my priorities are in order. This isn't a new problem for open world games, even outside of Bethesda's. So often the player is tasked to save the world, to close the Oblivion gates, to find Ciri and prevent the endless winter. Yet all around them are distractions. Races and card games, companions and damsels in distress. What bothers me so much about Fallout 4's opening is that the player's spouse gives the perfect solution for this problem. Why does my character, who wants only to rescue their son, give a damn about the minuteman or their settlements, why does he care whether or not they are safe? I think the player would care a lot if their wife was still alive, if she was back at Sanctuary Hills, trying to pick up their life while the player was out trying to rescue their son. Why does my character team up with these random companions, often after only a simple conversation when they could walk through the wasteland side by side with the person they swore to spend the rest of their life with? Shooting side by side against super mutants and the like? Why does my character care about the food supply of settlements, of rebuilding society when there's no one to rebuild it for? Even the two areas of growth for the character, their moral alignment and their relationship with companions would be made deeper by the presence of the player's spouse. In the beginning of the game, while your player is looking at their eyes in the mirror, your wife remarks that was on the reason she fell in love you, because of those eyes. Wouldn't it be better to have her comment on those same eyes hours into the game, how they've hardened thanks to the horrors of the wasteland, or how, even after everything they've been through they still have that same kindness she fell in love with? The same applies to companions. Maybe she's supportive of the synths, or doesn't trust you bringing one around the house. There's a throwaway line in the beginning about her taking time to trust the handyman with your son, how does she react to a walking, talking Synth in the house? What about your female companions? Is she jealous? Does the player feel more drawn to a tough woman of the wasteland than to his sheltered wife back home? There's so much room to explore, so many avenues to go down with these characters that would enhance the experience while simultaneously helping to ground the player in the accomplishments around him, that give the player reason for their actions. Instead they took the easy way out.They took the simple route. Why worry about any of this, why give this person character, give them hopes and dreams when they could shoot her in the head and be done? The last thing I'll say is this, one of the first things you get after waking up is a recording your wife made for you, safeguarded all this time by your trusty house robot. It's a tear jerking tape of your wife and laughing son telling you what a great father you are, of how much your wife is looking forward to the two of you spending more time together as your try and raise your son in a rapidly changing world. It's a great tape, one of the rare instances in games when audio logs actually have a meaningful impact. It's shame, cause I would have like to see far more of that interaction between wife and husband. Instead I'm left with only a corpse sitting in a Cryo tank. With a wedding band in my inventory to symbolize all the conversations that were lost. All I'm left with is a wife that was shot in the head.